1 The ancient world was full of wonders that ranged from magnificent temples to gigantic statues. Seven incredible creations became known as the Seven Wonders of the Ancient World. Even though most of these Wonders are gone, their memory still inspires us today. 2 The Egyptian pharaoh Khufu built the Great Pyramid of Cheops around 2560 B.C. The Great Pyramid was originally 481 feet tall, but it lost about 30 feet off of its top over time. It was made with about 2 million blocks that weighed over two tons each! Inside, the builders created corridors, galleries, and shafts. The King's chamber is at the center of the pyramid, and its walls are covered with red granite. 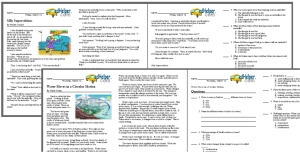 3 No one knows exactly how the Egyptians built the pyramids. Some historians believe that the Egyptians used a ramp coated with mud and water to move the huge stones. Others believe that long levers moved the great blocks. All the stones inside the pyramid fit so closely together that a playing card can't fit between them. The Egyptians were master builders of ancient times and for all time. Their art reached its pinnacle in the construction of the Great Pyramid. 4 The Mausoleum at Halicarnassus commemorated another ancient leader. Unlike the Great Pyramid, this gigantic tomb was known for its beauty rather than its size. This white alabaster building was decorated with gold and surrounded by columns. A statue of a chariot pulled by four horses sat on top of the tomb. Life-size statues of people, horses, and lions decorated the roof. The Mausoleum was finished in 350 B.C. It became famous, even though no one remembers the king who built it. 5 Some Wonders remembered dead kings, but one Wonder was alive. 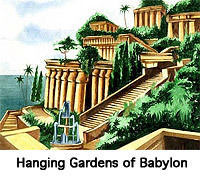 The Hanging Gardens of Babylon was in present-day Iraq. Legends say that these beautiful gardens were built by King Nebuchadnezzar for his wife. We don't know exactly what these beautiful gardens looked like, but poets and historians have written that they were filled with fruits, flowers, waterfalls, and gardens hanging from the palace terraces. In the dry climate, it must have seemed like a lush oasis in the ancient world.